For other people with a similar name, see James MacArthur (disambiguation). James McFarlane McArthur (born 7 October 1987) is a Scottish footballer who plays as a central midfielder for Premier League club Crystal Palace. McArthur started his career at Hamilton Academical and was part of the team that won the 2007–08 Scottish First Division title. He made over 190 appearances for Hamilton before joining Wigan Athletic in July 2010. McArthur helped Wigan win the FA Cup in 2013. He was transferred to Crystal Palace in the summer of 2014. McArthur made 32 international appearances for the Scotland national team between 2010 and 2017. Born in Glasgow and raised in the city's Barrowfield district, McArthur attended Whitehill Secondary School and supported Rangers in his youth; he played for Rangers South BC (alongside future international colleagues Robert Snodgrass and Graham Dorrans), St Johnstone pro youth, Rangers SABC and Clyde before moving to Hamilton Academical as a youth in 2003. He made his professional debut in January 2005 against Ross County. He established himself in the Hamilton team the following season and scored his first goal in April 2006 against St Johnstone. Such was his progress that he was given the captaincy for Hamilton against Aberdeen in February 2008 for a Scottish Cup tie and nominated for the First Division Player of the Year for the 2007–08 season. 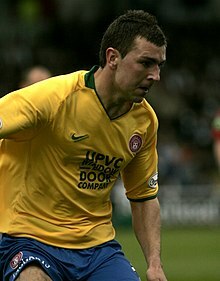 In May 2008 after helping his side to the Scottish First Division, McArthur was awarded with a new three-year contract. By the time he departed from New Douglas Park aged 22, he had played in nearly 200 matches for Accies. In the 2009–10 season, several English Championship and Premier League clubs, including Sheffield United, West Bromwich Albion, Leeds United and Sunderland, showed an interest in McArthur. On 5 April 2010, McArthur went on a three-day visit to Premier League club Wigan Athletic with a view to a permanent move in the summer. He signed a four-year contract at the DW Stadium on 23 July for a fee of around £500,000. The move reunited him with former Hamilton teammate James McCarthy, who had made the same move at the beginning of the 2009–10 season. On 31 January 2012, McArthur scored his first goal for Wigan in a 3–1 loss to Tottenham Hotspur, and followed it up two games later with a winning goal over Bolton Wanderers at the Reebok Stadium in a game which finished 2–1 to Wigan. McArthur extended his contract with Wigan in May 2012, with the new deal due to run until 2016. On 11 May 2013 McArthur won the FA Cup, playing the whole game in a 1–0 upset win against Manchester City. However, only three days later, Wigan were relegated from the Premier League following a 4–1 defeat against Arsenal. Wigan rejected a first offer of £5 million from Leicester City for McArthur in August 2014, but then accepted a proposed valuation of nearly £7 million. A payment schedule was not agreed and the proposed transfer collapsed, with Leicester signing Esteban Cambiasso instead. On the last day of the summer 2014 transfer window, Wigan accepted a £7 million offer from Crystal Palace for McArthur. On 1 September 2014, McArthur signed a three-year contract with Crystal Palace after joining from Wigan Athletic for an undisclosed fee; due to a clause in his Wigan contract, his former club Hamilton received a sell-on fee from the Crystal Palace transfer, which they used to invest in the youth system through which the player had emerged. McArthur scored his first goal for Palace on 13 December, in a 1–1 draw against Stoke City. In February 2016, McArthur tore ankle ligaments in a 2–1 loss to AFC Bournemouth. He returned in time to take part in the 2016 FA Cup Final, which Crystal Palace lost 2–1 to Manchester United after extra time. In May 2018, having helped his club to maintain top division status for the fifth consecutive season of his spell at Selhurst Park, McArthur was recognised by the Premier League for reaching 200 appearances in the competition. He was first called up to the Scotland under-21 squad in February 2008, and he made his debut at that level against Ukraine later that month. On 16 November 2010, McArthur made his senior international debut as a second-half substitute for Charlie Adam against the Faroe Islands. He scored his first international goal on 9 February 2011, in a Nations Cup match against Northern Ireland. As of August 2018, McArthur had made 32 international appearances and scored four goals. At this time he advised Scotland manager Alex McLeish that he wished to be excused from international games while he managed ongoing back problems. Later that year, he announced his retirement from international football. As of match played 1 September 2017. As of match played 7 October 2017. Scotland score listed first, score column indicates score after each McArthur goal. ^ "James McArthur". Barry Hugman's Footballers. Retrieved 17 April 2017. ^ Rollin, Glenda; Rollin, Jack, eds. (2012). Sky Sports Football Yearbook 2012–2013 (43rd ed.). London: Headline. p. 553. ISBN 978-0-7553-6356-8. ^ "Premier League Player Profile". Premier League. Retrieved 18 March 2011. ^ a b "Robert Snodgrass: Grassroots football in Glasgow was tough... but it is brilliant". Daily Record. 20 March 2016. Retrieved 11 July 2018. ^ "SABC continue to create stars for the future". Youth Football Scotland. 6 November 2013. Retrieved 9 December 2017. ^ "Family feeling is the secret of success so far for Hamilton". The Herald. 26 February 2009. Retrieved 25 September 2017. ^ "James McArthur: 'I'll always remember Don Hutchison's goal'". The Scotsman. 8 June 2017. Retrieved 25 September 2017. ^ "James McArthur". Youth Football Scotland. Retrieved 22 February 2011. ^ "Aberdeen 1 Accies 0". Hamilton Academical F.C. 2 February 2008. Archived from the original on 7 February 2008. Retrieved 7 April 2008. ^ "Dorrans and McDonald on shortlist". BBC Sport. 7 April 2008. ^ "Hamilton Accies' James McArthur to visit Wigan". BBC Sport. 4 April 2010. ^ "James McArthur completes move from Hamilton to Wigan". BBC Sport. 23 July 2010. ^ "Wigan extend contract of Scotland midfielder James McArthur". BBC Sport. 18 May 2012. Retrieved 27 August 2014. ^ a b "Man City 0 - 1 Wigan". BBC Sport. 11 May 2013. Retrieved 19 May 2013. ^ "Arsenal 4 - 1 Wigan". BBC Sport. 14 May 2013. Retrieved 19 May 2013. ^ "James McArthur: Leicester set to sign Wigan Athletic midfielder". BBC Sport. 27 August 2014. Retrieved 27 August 2014. ^ "James McArthur: Leicester move for Wigan midfielder collapses". BBC Sport. 29 August 2014. Retrieved 29 August 2014. ^ "Transfer deadline day: Crystal Palace to sign Wigan's McArthur". BBC Sport. 1 September 2014. Retrieved 1 September 2014. ^ "James McArthur: Eagles Make Deadline Day Swoop For McArthur". Crystal Palace Football Club. Crystal Palace Football Club. 1 September 2014. Retrieved 1 September 2014. ^ Grahame, Ewing (7 October 2014). "James McArthur: Scottish sides can follow Hamilton's youth policy". The Daily Telegraph. Retrieved 25 September 2017. ^ Oscroft, Tim (13 December 2014). "Crystal Palace 1–1 Stoke". BBC Sport. Retrieved 16 December 2014. ^ "Crystal Palace's James McArthur and Jason Puncheon injured". BBC Sport. 4 February 2016. Retrieved 4 February 2016. ^ a b Phil McNulty (21 May 2016). "Crystal Palace 1–2 Manchester United (aet)". BBC Sport. Retrieved 28 January 2019. ^ "Premier League Milestones". Premier League. 23 May 2018. Retrieved 21 September 2018. ^ "Reid delight at McArthur call-up". BBC Sport. 5 February 2008. ^ "McArthur Earns First Cap". Hamilton Academical FC. 7 February 2008. Archived from the original on 18 June 2008. Retrieved 7 February 2008. ^ McDaid, David (16 November 2010). "Scotland 3–0 Faroe Islands". BBC Sport. ^ "Comfortable Carling Nations Cup win for Scotland". Scottish Football Association. 9 February 2011. Retrieved 29 March 2014. ^ a b Winton, Richard (26 August 2018). "Scotland: Crystal Palace's James McArthur out, Hearts' John Souttar in". BBC Sport. Retrieved 26 August 2018. ^ "James McArthur: Crystal Palace midfielder retires from Scotland duty". BBC Sport. 29 October 2018. Retrieved 29 October 2018. ^ "Games played by James McArthur in 2004/2005". Soccerbase. Centurycomm. Retrieved 20 June 2014. ^ "Games played by James McArthur in 2005/2006". Soccerbase. Centurycomm. Retrieved 20 June 2014. ^ "Games played by James McArthur in 2006/2007". Soccerbase. Centurycomm. Retrieved 20 June 2014. ^ "Games played by James McArthur in 2007/2008". Soccerbase. Centurycomm. Retrieved 20 June 2014. ^ "Games played by James McArthur in 2008/2009". Soccerbase. Centurycomm. Retrieved 20 June 2014. ^ "Games played by James McArthur in 2009/2010". Soccerbase. Centurycomm. Retrieved 20 June 2014. ^ "Games played by James McArthur in 2010/2011". Soccerbase. Centurycomm. Retrieved 20 June 2014. ^ "Games played by James McArthur in 2011/2012". Soccerbase. Centurycomm. Retrieved 20 June 2014. ^ "Games played by James McArthur in 2012/2013". Soccerbase. Centurycomm. Retrieved 20 June 2014. ^ "Games played by James McArthur in 2013/2014". Soccerbase. Centurycomm. Retrieved 20 June 2014. ^ a b "Games played by James McArthur in 2014/2015". Soccerbase. Centurycomm. Retrieved 20 June 2014. ^ "Games played by James McArthur in 2015/2016". Soccerbase. Centurycomm. Retrieved 13 September 2014. ^ "Games played by James McArthur in 2016/2017". Soccerbase. Centurycomm. Retrieved 24 August 2016. ^ "Games played by James McArthur in 2017/2018". Soccerbase. Centurycomm. Retrieved 20 August 2017. ^ "Games played by James McArthur in 2018/2019". Soccerbase. Centurycomm. Retrieved 11 August 2018. ^ "James McArthur". National Football Teams. Benjamin Strack-Zimmerman. Retrieved 20 June 2014. ^ "James McArthur". Scottish Football Association. Retrieved 13 October 2016. Wikimedia Commons has media related to James McArthur.